Exposure: Exposure: 16 x 15 min (1x1 bin) exposure with IR/UV Block filter, 8 x 4.5 min (2x2 bin) RGB exposures. Processing: Data Collection - Sequence Generator Pro (as FITs). Exposure calibration, LRGB registration, and stacking (Median combine - Winsorized Sigma Clipping) - PixInsight. LRGB channel registration, equalization and gradient removal - PixInsight. Curves, Levels, RGB combine, Luminance layering - PixInsight. Final finishing - Photoshop. RGB calibration - eXcalibrator. This image is a RGB combine with Luminance layering. Images processed at 3352 x 2532 resolution. Final Image size is approximately 2800 x 2100. North is up in this image. 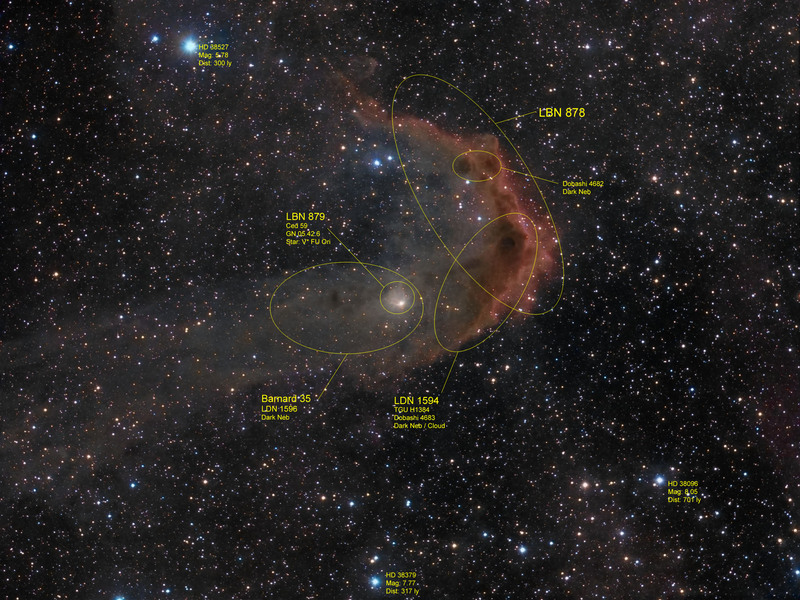 The main object in this image is LBN 878. It is the red and brown nebula dominating the field. The full nebula complex is a combination of emission and dark nebulae. Included in this overall object structure is LBN 879 which is in association with the variable star FU Ori. LBN 879 is the small bright nebula in the centers and is also known as CED 59. The dark nebula Barnard 35 encompasses the LBN 879 structure. The very dark portion of the red part of LBN 878 is the dark nebula LDN 1594. Some of the other dark nebulae structures are included in the Dobashi and TGU catalogs. These objects and some bright stars are identified in the annotated image.. Horizontal FOV is approximately 88 arc minutes (1.88 arcsec/pix image scale on the full size image). Image center is located approximately - Equatorial 2000: RA: 05h 45m 22s Dec: +09°04'12"